Being a Marketer, I always know that building a good brand image matters a lot for the well being of a brand. One thing that is taught in marketing management is that the customer is the king and he should be served royally. But what happens in reality is that the customer is made to think that he is a king where as he actually is treated like a joker. Check the following picture. Both are white color T shirts. Both are made from the same finest wool. Both have the same texture. But, just because one T shirt has a small Tick logo, it has a higher price. 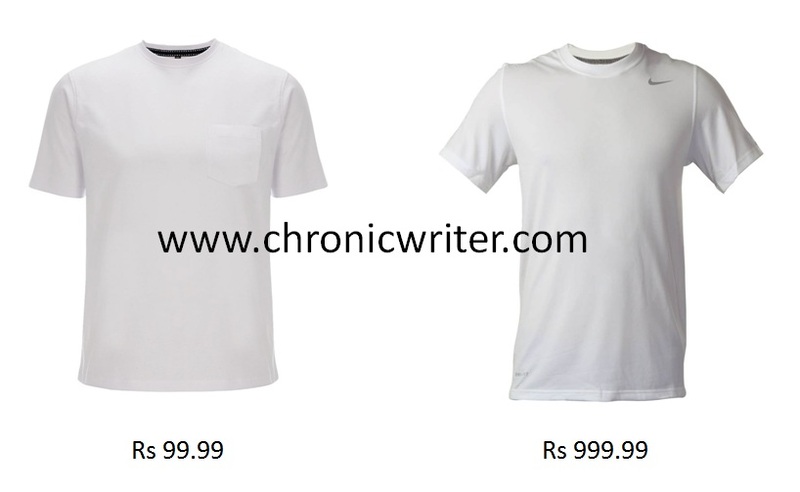 The Brand- sensitive fools will buy the Costlier shirt and will treat the cheaper shirt with disdain and contempt. Have you come across people saying that they wear only branded shirts? When ever I hear some one saying that, I always feel like telling them " It is not in the brand but it is in the mind". Even if one wears a costly branded shirt, if the guy does not have manners and if he does not know how to carry himself well, the shirt is of no use at all. At the same time a man who knows how to carry himself well will be able to project himself well even in torn clothes. Remember one thing! Brand Mind matters. What ever said and done, we are still the kind of people who make assumptions based on external appearances. Our living room might look cool, but most toilets are not kept clean at all. Even in the drawing room the dirt is often swept under the carpet. Don't look at people and draw to conclusions. Look through them, and when you do that every person will look wonderful to you. Nice post, was thinking on similar lines yesterday, idea for a new post. okhay so i loved reading this and agree a 100%. Companies ripping people off in the name of brand value is pathetic and people are in general ruled by the snob effect. but heres a counter argument...brands kinda do matter. maybe not in mindless retail like clothes and shoes but think about it in terms of more important stuff. everytime a business does something right it gains a little respect and trust. businesses encash on this intangible thing called consumer satisfaction through creating a brand and setting it self apart making it identifiable in the market. would you not mind paying rs 10. for a branded paracetamol strip than some loose tablets for rs 1 assured personally by the chemist when ur family member is running a fever? u would pay happily 9 rs premium for quality, for trust and for safety. At the same time this co will not mind spending an extra buck in ensuring a 100% quality control whn it is charging u so much. the truth is that we pay for our own satisfaction. not less. not more. ya I have so many pple blatantly and shamelessly flaunting their brands.. that is so cheap..but thats the culture thse days! "Even if one wears a costly branded shirt, if the guy does not have manners and if he does not know how to carry himself well, the shirt is of no use at all. At the same time a man who knows how to carry himself well will be able to project himself well even in torn clothes."